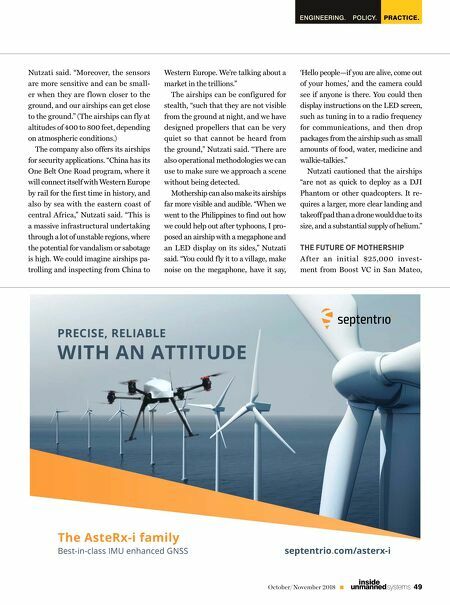 AIR POWER SOURCES 48 October/November 2018 unmanned systems inside "The market for pipeline inspection is $37 billion in the United States alone, and there are related markets such as highway inspec- tion, railroad inspection and water infrastruc- ture inspection, which are also huge," Nutzati said. "Inspection with the TerraSoar will bring reduced costs, improved safety and a higher actionability and quality of data." "Drones have been slow to break into the pipeline inspection business due to their short range and f light times and FAA visibility re- quirements," Nutzati continued. "Currently, the FAA limits operations of unmanned aerial vehicles to within line-of-sight of the opera- tor. At 8 to 12 meters length, TerraSoar can be seen at over 10 times the distance of the largest inspection drones on the market…line of sight operations for us can easily reach 5 kilometers." Mothership was working on an FAA Beyond Visual Line of Sight (BVLOS) waiver, but "we have paused this because we have found substantial interest in markets where such regulations are not as restrictive," Nutzati said. "We felt directing our resources at U.S. BVLOS wouldn't be most effective, given that there are people in the U.S. with deeper pock- ets already paving the way for us." Another possible application for the airships is in mineral discovery for mining. Nutzati not- ed a mining exploration company working in Brazil was paid $500 million to hang a mag- netic sensor from a helicopter to look for gold over 500 square kilometers of jungle. "I heard that and thought, 'Wow, that would be an awe- some application for our aircraft, and there is definitely money in it,'" he said. 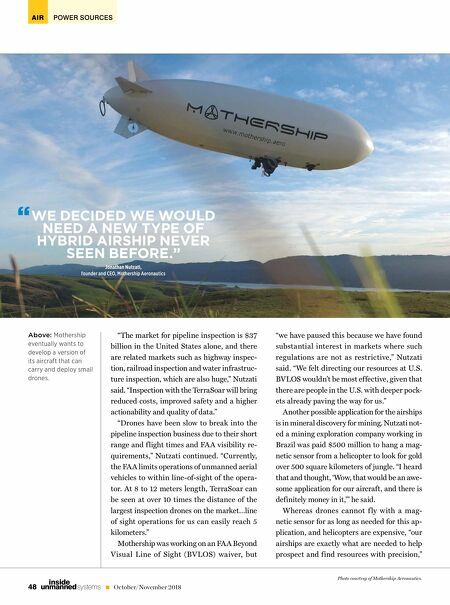 Whereas drones cannot f ly with a mag- netic sensor for as long as needed for this ap- plication, and helicopters are expensive, "our airships are exactly what are needed to help prospect and find resources with precision," Photo courtesy of Mothership Aeronautics. Above: Mothership eventually wants to develop a version of its aircraft that can carry and deploy small drones. WE DECIDED WE WOULD NEED A NEW TYPE OF HYBRID AIRSHIP NEVER SEEN BEFORE." Jonathan Nutzati, founder and CEO, Mothership Aeronautics "